How to schedule a single report to multiple users such that each user only receive their own records? Typical requirement of CRM Administrator: I have a Sales team of 15 Sales Managers and need to send them report of “Opportunities nearing Close date” every week. However please note that each sales manager should receive only their records and not everyone’s. Isn’t that a lot of work? to not only build but also to maintain! Zap Objects now brings to you a new innovative approach called as “Bulk Scheduling” which would achieve this requirement with just 1 report and 1 RS Configuration record…greatly simplifying the task of creating and maintaining the schedule! Step 2: Now select a team in field “Select Team”. All users of selected team will receive the report. => Test Mode: If test mode is checked then the emails are created but not sent. The email activity status is kept as draft. 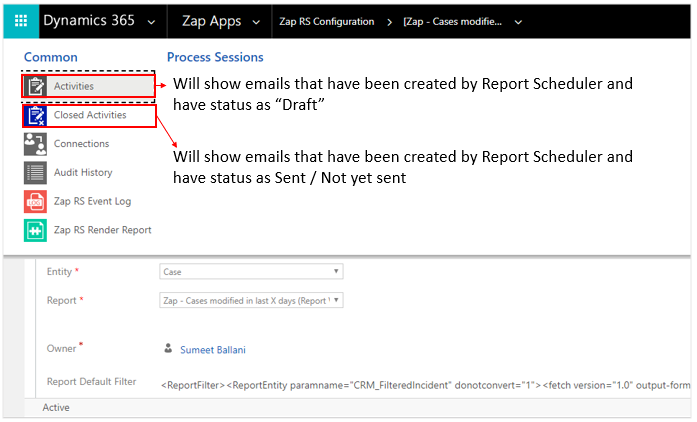 These email activities will show up in related “Activities” section (of RS Configuration record) but not in “Closed Activities” section. In bulk report scheduling, all users of the team will receive a seperate email with report having records where they are the owner. The team used when configuring Bulk Scheduling should have no more than 20 users.